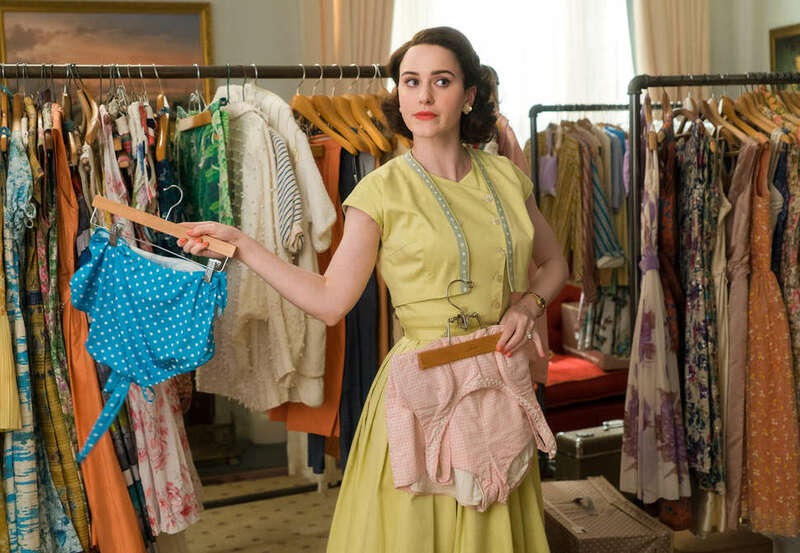 This story contains mild spoilers for the second season of The Marvelous Mrs. Maisel. There's a detail in the second season of The Marvelous Mrs. Maisel that reminded me just how absurdly wonderful this show can be. Midge (Rachel Brosnahan) and her new potential love interest (Zachary Levi) go see a Broadway show. The production -- a play about Lizzie Borden called The Legend of Lizzie -- is terrible, and they decide to leave at intermission. The Legend of Lizzie sounds like it's from the brain of creator Amy Sherman-Palladino, who spent years coming up with strange traditions in the Gilmore Girls town of Stars Hollow. But The Legend of Lizzie actually existed. It ran for two nights and then closed. It's details like this -- plus the Barbra Streisand-heavy soundtrack and the glorious costumes -- that make The Marvelous Mrs. Maisel a show that will always win my heart, if not always my head. Because for all of the zippy fun present in second season, I'm having some Gilmore flashbacks that aren't pretty. Sherman-Palladino's worlds are widely beloved, yet also distinctly not for everyone. Don't like mile-a-minute-dialogue laden with pop culture references so deep you might have to take out a shovel? Stay away. For others, like yours truly, they are catnip. But even I am willing to admit their flaws. Gilmore Girls, for example, featured male love interests who stayed on the show long past their prime. The series was oddly invested in Rory's dad, Christopher, continually trying to throw him back together with her mother, Lorelai, despite the fact that the whole show was predicated on Lorelai's choosing to leave him behind to pursue a life on her own terms with her daughter. Then there was Dean. In Season 1 he was a dreamy, well-read heartthrob. By Season 4, he was cheating on his wife with Rory. And don't get me started on Logan. (I'm Team Jess, if you hadn't noticed.) For all of the female energy Sherman-Palladino gave her signature WB show, there were always some lame-duck males hanging around. 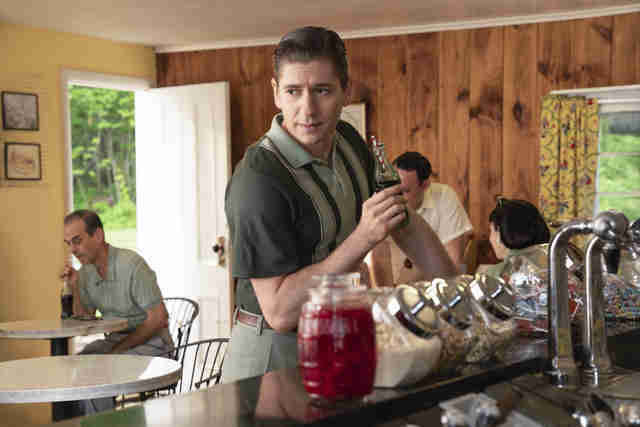 In Maisel, there's Joel (Michael Zegen). Once again, Maisel's entire premise relies on Midge leaving her philandering spouse in the dust as she gets her Lenny Bruce on, but Joel now has an even bigger presence in the narrative than he did in the first season. He's living with his parents, depressed, and in need of work. Suddenly we're asked to be invested in the fate of the older Maisels' finances and their inefficient textiles business. Entire scenes totally unrelated to Midge are dedicated to this subject. Why? I've seen the argument floating around that Joel should be excised from the show entirely, and while I don't agree with that -- their broken chemistry feels oddly genuine -- he's largely irrelevant independent of her. The first three episodes of the new season, then, oddly feel like filler -- often fun filler, but filler nonetheless. The cold war between Midge's parents Rose (Marin Hinkle) and Abe (Tony Shalhoub) recalls some of the hurdles Sherman-Palladino made Emily and Richard Gilmore jump through, but it's resolved with a somewhat inexplicable trip to Paris. (Somehow it seems unlikely that a French crowd would respond well to Midge commandeering a stage and doing a whole set in a different language. But in the fantasy of the show she kills.) Another plot involves Midge organizing a wedding for her B. Altman department store pal (Erin Darke), and then subsequently sticking her foot in her mouth. It's a narrative that touches on how Midge's comedic instincts can hurt those around her, but it still feels like nothing more than a diversion. That's why it's a blessing in episode four when the action picks up and moves to the Catskills. With all the major characters in one place -- a sweaty resort where gossip and games reigns -- Sherman-Palladino's mastery of quirk gets a chance to shine. It's 1959, and the premier vacation destination for Jewish families is going strong. (For what it's worth, Dirty Dancing, the pop culture Catskills touchpoint, takes place in 1963.) Away from the city, the tension between Joel and Midge has actual sparks, as they try to justify their dynamic to the other guests. Meanwhile, Midge's manager Susie (Alex Borstein) wanders around with a plunger, pretending to be an employee in order to get Midge some Borscht Belt gigs, and Abe is drinking tomato juice and doing calisthenics in a brain-curdling onesie. The setting allows the show to be at its goofiest -- there's a particularly amusing Simon Says sequence -- while advancing emotional beats. One of those beats involves the arrival of a significant new character, Benjamin, the man who sees the terrible Lizzie Borden play with Midge. He's a cold, cereal-loving doctor played by Zachary Levi, and is one of the few people who's not immediately susceptible to her many charms. Levi, best known as Chuck on Chuck, adds a much needed counterbalance to some of the zaniness. He's a physically imposing blockade to some of the fun everyone else seems to be having. In other words, he's a perfect foil for Midge, even though it doesn't take that long for them to realize that maybe they're meant to be. Compared to Joel, he feels like an actual equal for her -- or, at least, he's not threatened by her talent. But, of course, the real romance of the show is the one Midge has with her newfound calling, and toward the middle of the season it starts to break her heart for once. That's where the series feels most potent. Midge's first time on the road with Susie is inspired material, highlighting how the job isn't all instant applause and gratification. So color me disappointed that in the final moments of the season -- which appear to be entirely about a professional triumph -- Sherman-Palladino once again retreats into the philandering arms of one Joel Maisel. Midge (and we) deserve better.